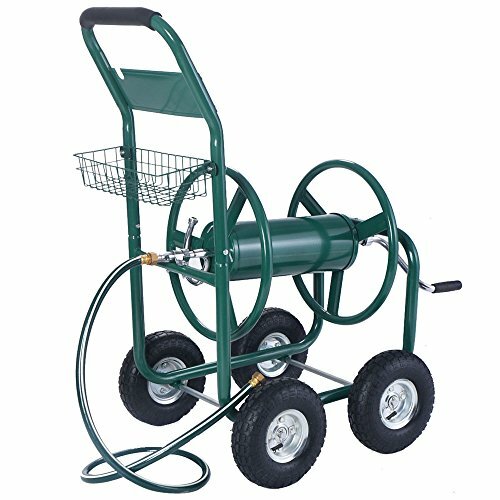 This Is Our Water Hose Reel Cart ,Which Is Suit For Most Of People Those Wish Their Garden Hose Would Stay Untangled. Operation For Manual Rewind Yard Hose Reel Is Convenient, 300 Ft Capacity Side Track Garden Guide Makes Unwinding And Winding Hose Easier And Storage Less Space For Holding Watering Accessories, All You Have To Do Is Pull The Hose And Turn The Water On. Then You Can Spend Time Making Sure Your Garden Gets Watered, And Not Trying To Untangle The Hose. The Features For It To Make Sure Watertight Connection Between Hose Reel And Hose More Closely. Hold Up To 300 Feet Of 5/8" Water Hose. Solid Steel Axles And Air Inflation Wheels. Oam-Padded Handle And Solid Steel Axles With Strong Powder-Coated Green Steel Frame For Faster And Easier Job. Wheels Roll Smoothly For Easily Transport Your Hose Around The Yard. Brand New And Good Quality. Assembly Required. As our products are all in US warehouse, you can get the product among 3-7 days. If you have any questions about this product by Anbeaut, contact us by completing and submitting the form below. If you are looking for a specif part number, please include it with your message.